Described as a “radiant spirit” who was “absolutely independent in her tastes and courageous in her method of doing things,” American collector Lillie P. Bliss (1864-1931) was said to have both an “instinctive love of the arts and a finely trained aesthetic perception.” Raised in New York City, Bliss was an accomplished pianist whose interests included not only music, but also theater and the visual arts. However, like her contemporary John Quinn, Bliss did not begin collecting art until she was in her forties. Her initial purchases were rather conservative and included drawings and prints by Joseph Pennell, Charles Daubigny, and Eugène Delacroix. In 1909, Bliss met American artist Arthur Davies whose influence would subsequently transform her tastes and interests. For two decades, Davies served as Bliss’s art advisor and she in turn was his most consistent patron. 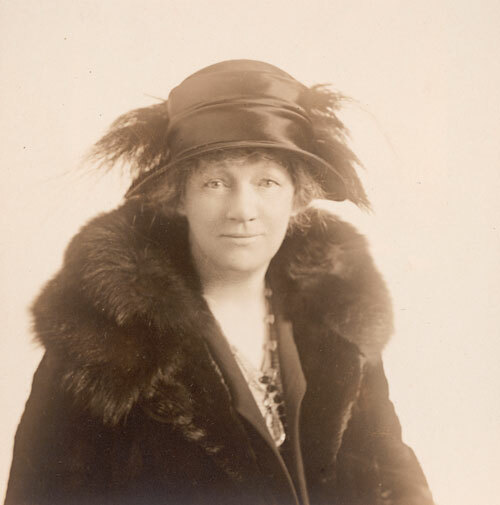 In 1913, when Davies was planning the Armory Show, Bliss was among the exhibition’s financial backers, although her contributions remained anonymous. She also visited the show daily and lent three works, including Degas’ Jockeys on Horseback Before Distant Hills. Although Bliss was familiar with examples of Impressionist and Post-Impressionist art – Davies had introduced her to Cézanne’s work as early as 1911 – the Armory Show marked her first broad encounter with the newest tendencies in European modernism. Bliss responded with great enthusiasm and on February 22, 1913 the collector made her first purchases: three lithographs by Renoir and two by Redon. Four days later, she bought six additional Redon works, including four lithographs, an etching entitled Petit prélat and an oil entitled Le Silence. Redon was virtually unknown to American audiences and Bliss’s purchases reveal the influence of Davies (who was quite fond of the artist’s work), as well as her own progressive and adventurous spirit. Before the end of the exhibition Bliss acquired eight additional prints by Cézanne, Gauguin, Denis, and Vuillard. These works formed the foundation upon which she built an extensive art collection, later bequeathed to the Museum of Modern Art. Bliss had been a founding member of the museum in 1929, which followed in the footsteps of the Armory Show and established a permanent venue for the exhibition of modern art in America.